Lock in a great price for I Tre Abeti B&B – rated 9.5 by recent guests! First of all, great hospitality. We have been welcomed by Patricia which made us feel comfortable like family. There are two friendly dogs in the beautiful yard. There's a pool and a nice place to eat outside. The room is quite big, there's a well equipped kitchen, a comfortable bed, a good shower. The atmosphere in this place is relaxed, and it's in a great location. Undoubtedly, a really good value for the money. Highly recommended! 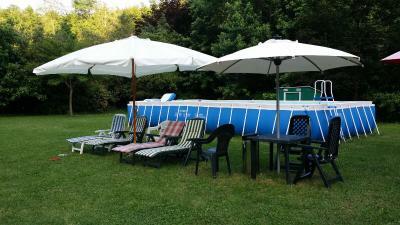 the location is great for this price, short drive from La Spezia. We got a small house with two bedrooms and a kitchen which had everything you need. The B&B is very easy to find, it's right on the main road. The owner is really really nice! We would love to come back again to stay longer. The hosts are such lovely people, very warm and welcoming. The apartment is big enough for two people and very clean. Nice aparment with air conditioner, big garden with swimming pool. Very kind hosts. Very well equipped kitchen. It took us ages to find as our satnav insisted we wanted to go somewhere else but when we finally found it we were delighted. The property was spacious, comfortable, magnificently equipped (even down to aircon) Above all, Patrizia, our host was one of the friendliest and most pleasant people we have ever met in our travels around Europe - both charming and helpful. We would be keen to stay again if we are in the area as it is one of the best B & Bs we have ever come across on our travels. Grazie Mille Patrizia! The family was very friendly and they reserve a restaurant for us. They gave important infos for travelling around the area. the garden is very nice and the table outside very convenient to have breakfast or a drink in the afternoon. Our accommodation was spacious and clean, the hosts were very welcoming. The garden was large and well kept. The pool was a really great addition. Fantastic location close to La Spezia which has great links to the cinque Terre. We took our little dog and the spacious garden was great for him to play and enjoy the sunshine. Will not hesitate to return if back in Italy. What a lovely surprise this was!! We received a very warm welcome by a man who's English wasn't great but together we tried our best to understand each other. He showed us around and explained everything. There are two really kind dogs living here. The owner asked us of we would mind the dogs walking around, which we didn't. If you're afraid of dogs maybe this isn't the place for you, but the dogs just made it more special to us. The apartment looks really new and modern. It is big enough for 2 people and it was clean. The kitchen has everything you need and the bathroom even has deodorant. The bed was too hard for me but my partner slept great. In the garden there's a pool you can use which we did and we loved it! It's a big plus! Breakfast is simple but good. We wanted to stay an extra night but unfortunately that wasn't possible. Friendly staff, nice garden, not far from La Spezia. One of our top picks in Vezzano Ligure – and a guest favorite. Featuring a private garden with self-standing swimming pool and BBQ facilities, I Tre Abeti B&B is in the peaceful Ligurian mountains, 10 minutes' drive from La Spezia. It offers free WiFi and private parking. Air conditioned and en suite, rooms at this Bed&Breakfast include a flat-screen satellite TV and parquet floors. Each bathroom comes with free toiletries and a hairdryer. Guests at I Tre Abeti enjoy free use of table tennis facilities and darts. They can find tables and chairs in the garden, and there is a shared kitchen too. This property also has one of the top-rated locations in Vezzano Ligure! Guests are happier about it compared to other properties in the area. 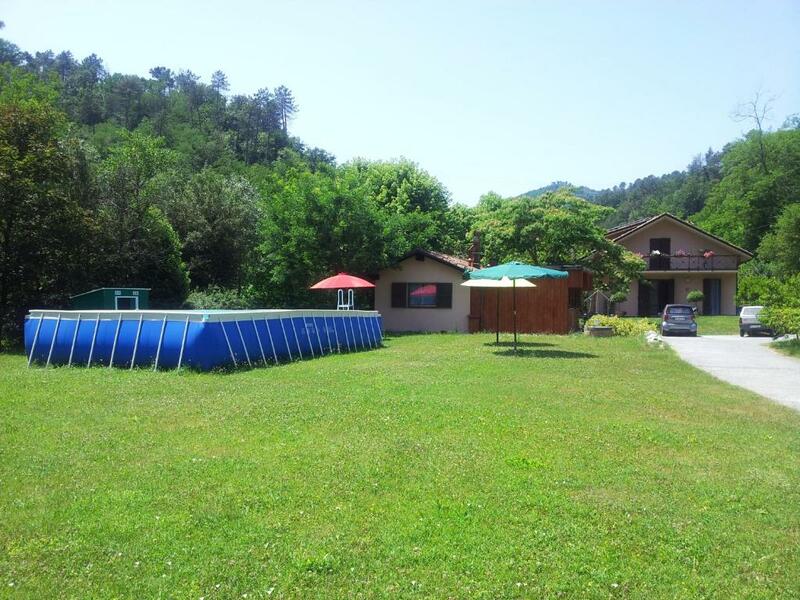 This property is also rated for the best value in Vezzano Ligure! Guests are getting more for their money when compared to other properties in this city. When would you like to stay at I Tre Abeti B&B? House Rules I Tre Abeti B&B takes special requests – add in the next step! I Tre Abeti B&amp;B accepts these cards and reserves the right to temporarily hold an amount prior to arrival. I Tre Abeti B&B accepts these cards and reserves the right to temporarily hold an amount prior to arrival. Please inform I Tre Abeti B&B of your expected arrival time in advance. You can use the Special Requests box when booking, or contact the property directly using the contact details in your confirmation. It was a bit hard to find at first. The address on Google maps is a little bit off. Breakfast you have to do by yourself. There were packaged sweet pastries and toasts in the kitchen. One day when we arrived back to apartment, the hosts had family party just right in front of our door until 11pm - very loudly. No network reception on our phones and the WiFi wasn't really stable. I must say we didn't ask the owners about it or asked them to reset the WiFi. Maybe after a reboot it would have been good. Nice location, not far from La Spezia, easy to reach by car. Good conditions. A comfortable studio with very good parking in the garden. I loved the well appointed studio which was airy and so modern. The owners and their dogs were so friendly.